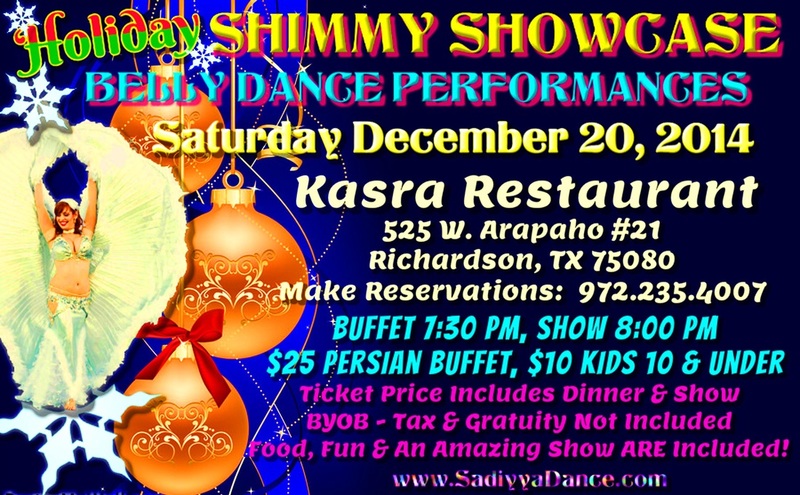 The next SHIMMY SHOWCASE will be on Saturday September 20, 2014 at Kasra Persian Cuisine in Richardson, TX! Vanessa Lynn Freedman and Sa'diyya have been collaborating for several months, and they are excited to share their creations! Don't miss the wonderful dance workshops which will be taught both together and individually by Vanessa Raqs, who's coming direct from Cairo, Egypt (the homeland of Belly Dance!) where she lives and works as a professional dancer and instructor - And by Sa'diyya, who just got back from a month long tour of South East Asia teaching and performing as the headlining artist at an array of belly dance events which attracted students from India, The Philippines, Thailand and China in order to study with Sa'diyya! All workshops limited to 12 students, except "Performance Skills & Drills" limited to 6 students only. First come, first serve! 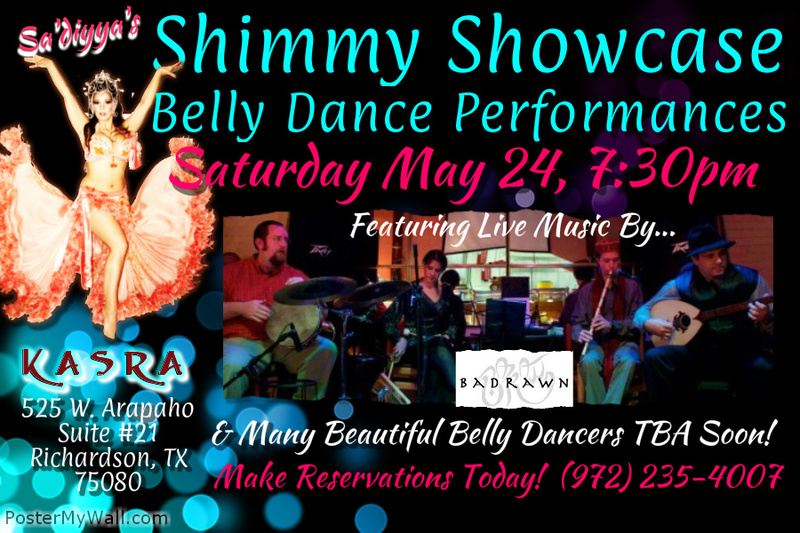 Sign up to dance at the next Shimmy Showcase! 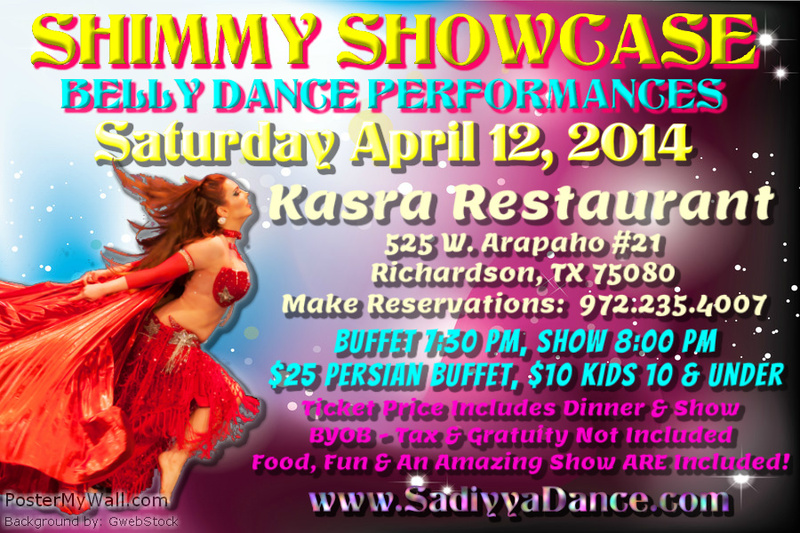 All performers receive a free buffet dinner. Time limits are 5 minutes for solos, 7 minutes for groups. Please be at Kasra between 7:00 and 7:15pm. The buffet is served at 7:30 and the show starts at 8pm. There is a dressing room / bathroom "backstage" which only the performers have access to. The dance floor is level with the dining room floor and it is wooden. It's about 12 feet x 12 feet. The dressing room is a good 10-15 paces from the edge of the dance floor.